← Missing Out verses Choosing In: Holiday Celebrations. 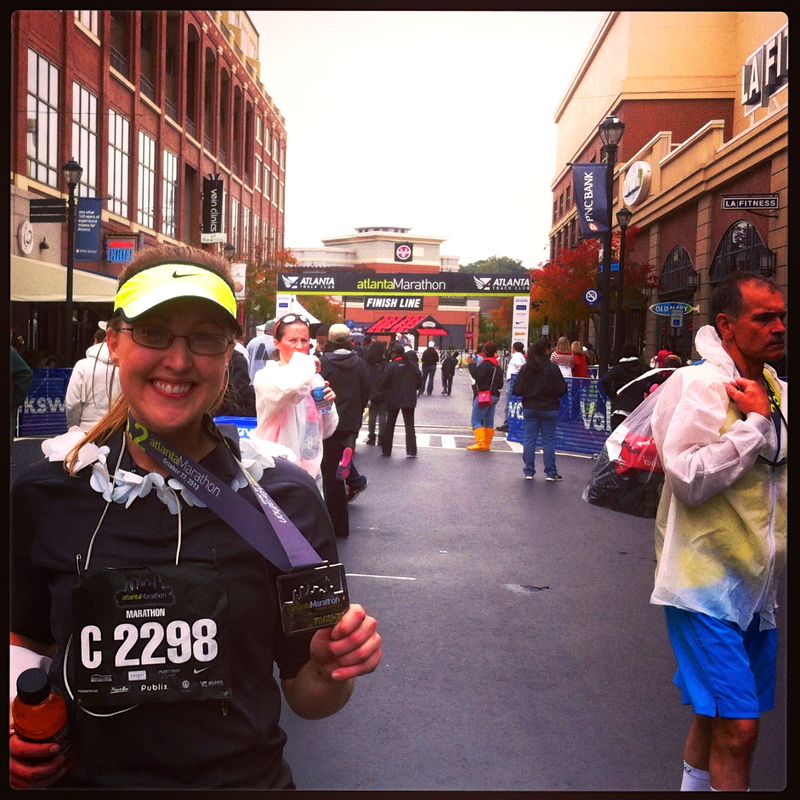 "Running the Race" is a short series about the lessons I learned through running a marathon. I wasn’t as ready as I would have liked to be. Even after months of working my tail off, I knew this would be one of the most strenuous things I’ve ever put my body through. Compared to the two half marathons I’ve run, this journey was quite different. Waking up at 3:45am, I only slept four hours the night before the race. I arrived at the Atlantic Station an hour early and waited around. There were only about 1,800 people running this marathon. After running the Disney Princess Half Marathon in February, which had a mega dance pre-party of 20,000 runners in costumes plus thousands of volunteers, this was a vastly un-epic opening of a race. Not to mention I was alone. I had no partner in crime for this insane thing I was about to do. So, I parked my car and began stretching my calves on the curb. An old man pulled into the parking spot next to me and asked if I knew where the start line was. We were instant friends. Runners apparently have this secret club you’re automatically put into once you start doing these events. Somehow, I snuck in. I mean, I’d run two half marathons, so since I had pretty running shoes and a legit dry-fit running skirt I could make myself look the part. So, me and old-man-winter were chumming it up in the parking lot. He’d just run the Chicago marathon two weeks ago. The more we talked, the more I felt like the kid who showed up for the adult party, just kind of walking around and not really understanding any of the conversation, but acting like I did. I felt ridiculously unworthy and unfit to be doing this race. Old man winter was OLD, and he’s running marathons like they’re cakewalks. First, compared to the other runners, I looked like a paranoid grandma from 1999 getting ready for y2k. I had protein bar bites, kleenex, and chapstick in one skirt pocket with my iPhone in the other. 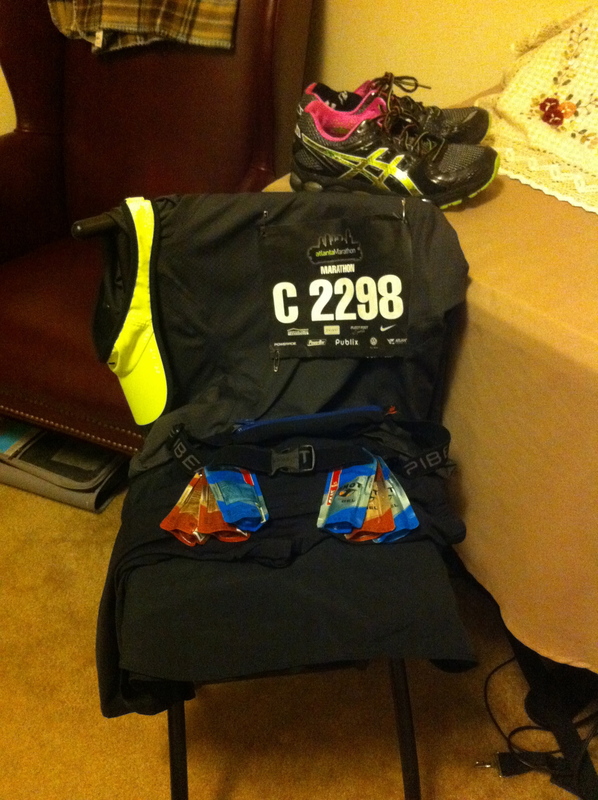 I had six Gu energy gel packs hooked on my running belt, plus IcyHot and ‘feminine’ products in my running belt pack. I had a iPod shuffle for tunes. At first, I felt like I was really prepared for this thing. Then I got to the start line with the “real” runners, and realized how silly I looked loaded down with Wal-Mart attached at the hip. Whatever. This was MY race, right? Who cares, right? I did, though. I didn’t want to, but I did care. I was also fighting the beginning of a cold, so I’d just gotten past the sore throat and into the congestion stages of nastiness. I was shivering at the start line in 45 degree weather. While blowing my nose, I watched people running and doing lunges, getting warmed up. Really? We’re about to run 26.2 miles, but people were running faster warm-ups than I planned to run at all today. Oh dear. I don’t have a clue what’s going on. Then, I overheard other runners talking about their goal times. After eavesdropping a bit, apparently this marathon is one big shot runners run because it’s a tougher course. It’s mostly hills. Not necessarily large hills, but it was never flat. With each conversation I overheard, my spirit dropped a little bit. What the heck was I doing? Because there’s always THAT girl. This time, I was that girl. THAT girl was just praying she doesn’t have to get picked up by a golf cart because of an injury, and if God so willingly let her go the distance, she could do it before they tore down the course for the day. My goal was just to finish, but I was scared of having to watch from the sidelines. The announcer began welcoming us to Atlanta. 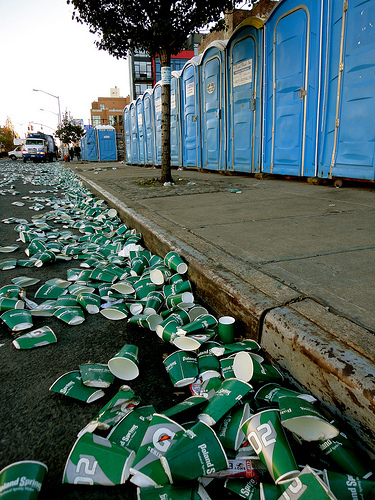 The massive line at the “Johnny-on the-spot” Port-o-Potties rushed to ’empty their tanks’ before the race. 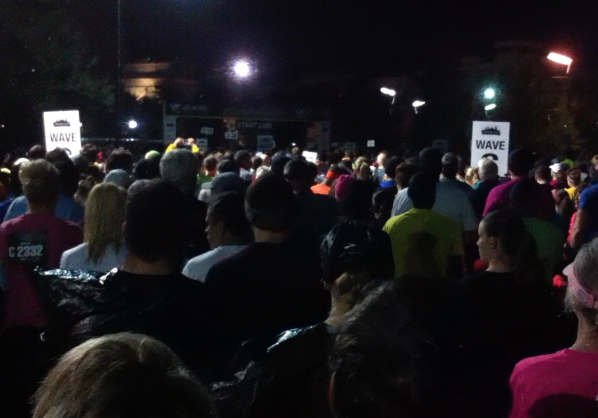 We all squeezed in tighter to our corrals, and the National Anthem was sung. No fireworks, just the sound of the gun announcing the race had started. It was still dark and chilly, but we were off! I couldn’t feel my feet for the first two miles because I was so cold. However, I kept up the pace. Adrenaline was still my friend, so I pushed forward through the orange cones marking the route along the streets of Atlanta. I felt really safe with the volunteer police directing traffic. The Atlanta Track Club had awesome pace-setter volunteers. There were people with little flags held high that said “4:00” finish, “4:30” finish, “5:00” finish, and so on. So, you could pace yourself with the flag to help you hit your finish-time goal. I hung with the 5:00 finish group for a good chunk of the beginning until I had to use the “Johnny on the Spot” at mile 6. Praise God for the Johnny’s. I needed them three times. One stop in the blue can, I found 20 bucks! That green piece of paper justified my competitive brain to stop one more time, even though it was wasting minutes on the clock. It ended up falling out of my pocket somewhere else along the way, though. Bummer. I had moments of victory as I made it up some rough hills. I had moments of defeat when gray-haired men and women passed me up. I had moments of delight when I danced through a group of cheer volunteers along the road. There were cheer teams that owned each mile. It was fun seeing how each group decided to set up their mile. I was really thankful for the groups giving out banana halves and apple slices and pretzels! the farthest training I completed was 16 miles, so I didn’t know how my body would react to such a long run, and it was HUNGRY! Around the half way mark, my legs began to tell me I never finished my training. There were more hills than I imagined, and I definitely didn’t train for those. Around mile 17 or 18, I got to a point where I couldn’t jog up another hill. So, I’d walk up the hills and let gravity help me jog back down. I began to take more pictures and text my friends updates to entertain myself as I pushed forward. My family was cheering me on from California. Several friends, who couldn’t make it to Atlanta in person, texted me encouragement as well. 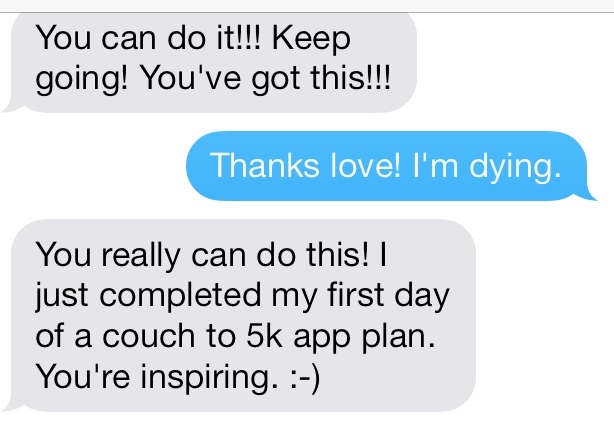 My co-worker, Stephanie May, sent a group text to a lot of my friends from work, encouraging them to send me texts, so I was flooded with love and cheers from lots of people toward the end of the race. My third Port-O stop put me behind the 5:30 finish group. I was disappointed for a while, but I began to praise God for the fact that I was doing it. I was running a marathon. My injury hadn’t flared up even though I could tell my hips were out of alignment. It was a gift from God that most of the course was on the right side of the street, so it angled down to the right just enough that it compensated for my left leg being a little shorter! It probably made it hard on other people, but it actually made it easier on me! While my entire body was exhausted and aching, I could keep moving forward. Even if I had to walk, I never had to stop moving forward. 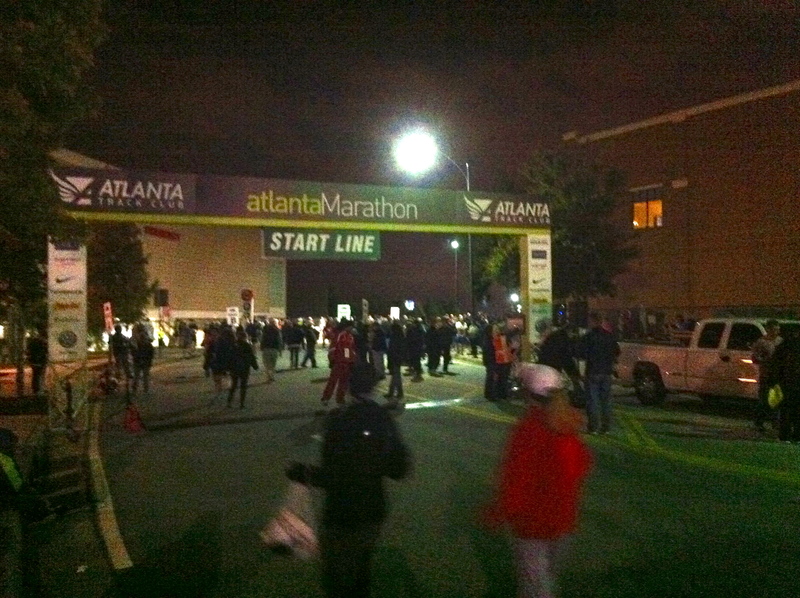 As I rounded the corner into Atlantic Station, most of the race crowd had already died out. There was just a handful of people there to cheer us on at the end. Honestly, it was kind of sad. However, since it was just me and one other girl coming in at 5:59, our names were announced as we crossed the finish line! The reality sunk in as the volunteer put the medal around my neck. The man said, “This was a huge victory! You finished a marathon! Congratulations! Way to go! You should be so proud!” I thanked him, grabbed a Gatorade and recovery snack pack, and walked away. 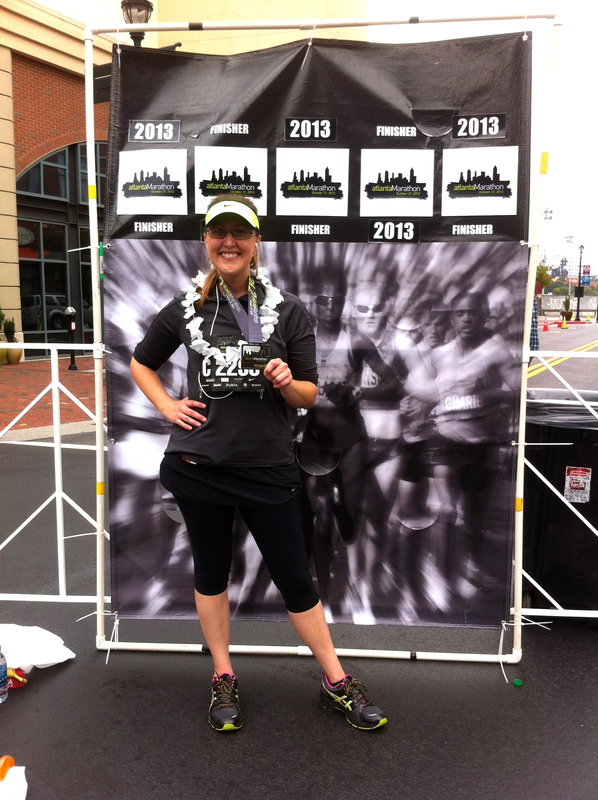 I found another girl who did the race by herself, and we took turns taking pictures for each other by the finish line. That was it. The race was over. Months of pain and agony of training and going through physical therapy all led up to this one day, this one moment, and it was over in an instant. All I had was Jesus and a bunch of people I didn’t know, but we were all there for the same reason. I flopped down on the sidewalk to stretch (AKA die) and eat my snacks, and called my mom. 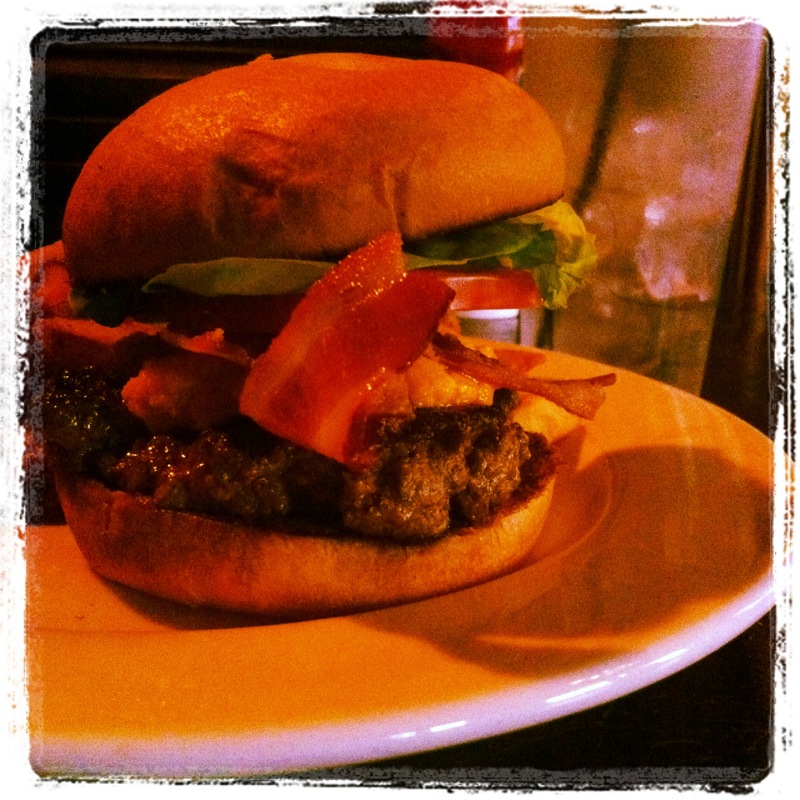 A friend met up with me a little later to share in a celebratory cheeseburger. I did it. I completed a marathon!